I think my day reached it's peak a little after dinner. I was flying solo while Amanda attempted to bring her latest/greatest project to completion(oh so close! update soon!). The boys were needing a little "guidance" in their choice of evening entertainment. Smash up derby between the plasma car and the radio flyer wasn't cutting it for me. The daylight was all but gone and we hadn't been out of the house once all day because of the torrential rain being inflicted on us by an obviously, vindictive god(dess?). 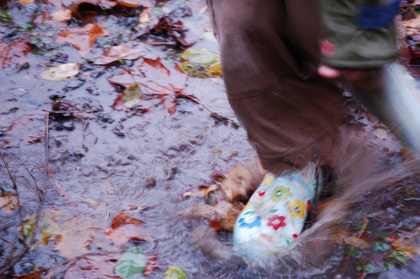 Well, Calvin went out for about ten minutes, around noon, but only because i bribed him with hot cocoa and a tubby if he ran through the deep puddle out back. 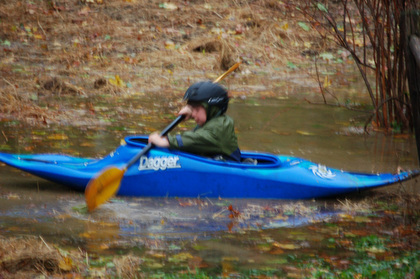 Later, on his own convincing, he headed out in the maelstrom once again, before dark, to do some yard kayaking. Excellent form. Sweet Ezra had a complete mental and physical breakdown around 5:30pm and fell asleep in my arms. Unfortunately, with daylight savings going down tonight, he'll probably be up around 4am. I didn't turn my attention back to Adelaide until I heard the dishes hitting the floor in the kitchen. Sure enough, I'd left the dishwasher wide open and she was unloading the contents for her Papa. How sweet. She's also becoming a master climber, the drawing table being her favorite target. She quietly pushes a chair out of the corner and up to the table. Silently and with nerves of steel, she goes up to pull the tops off every marker in sight. If you don't move quickly she won't only fall off the side but, display quite a collage on her lips and cheeks as she tries to gobble up said markers before you take them away. Oh, yes. The rainy day inside with the kids. 30 games of memory, indoor hide and seek(a crowd favorite) and we even got an encore presentation of Ezra's long running interpretive dance "doggie piano". There isn't enough coffee in town to keep me going on days like today. Don't get me wrong - I'm actually a big fan of inclement weather. The bigger the storm the more excited i get. Like my Grampie used to say, "Can't handle the winter, don't deserve the summer". Tomorrow's weather - sunny and windy with a high of 50degs and a possibility of some p.m. showers. I'll take it! Gotta hit the hay - Ez will be up any time. Night Night.